The GBU-57A-B Massive Ordnance Penetrator (MOP) is 5,300 pounds of high explosive wrapped in 30,000 pounds of steel, and designed to obliterate fortified positions and underground bunkers from the inside. Developed by the US Air Force with help from the Defense Threat Reduction Agency (DTRA) and built by Boeing, the $400 million MOP project is the largest Bunker Buster bomb in the US arsenal by a good 25,000 pounds; capable of burrowing through 60 feet of reinforced concrete. But the MOP may have met its match in Iran's Fordow nuclear enrichment complex. This 300-centrifuge facility isn't just tucked safely underground, it's buried under an entire mountain. Not even an MOP can punch through that much Earth—yet. And if the prospect of a nuclear-powered Iran weren't enough, Israel has matched Tehran's hardline saber-rattling, barb for barb, by promising a preemptive strike against Iran's nuclear facilities should the nation succeed in developing atomic weapons. To prevent this rhetorical powder keg from cascading into World War III (at least until Iran's national elections in June), the US has just finished an $86 million upgrade to the MOP, tuning it specifically to strike the Fordow facility, in hopes of dissuading the Israeli's from launching unilateral action. The newest iteration of the GBU-57AB employs a sturdier detonator fuse than its predecessor, allowing the new version to drive further into the multiple layers of granite and steel that insulate the complex before detonating. 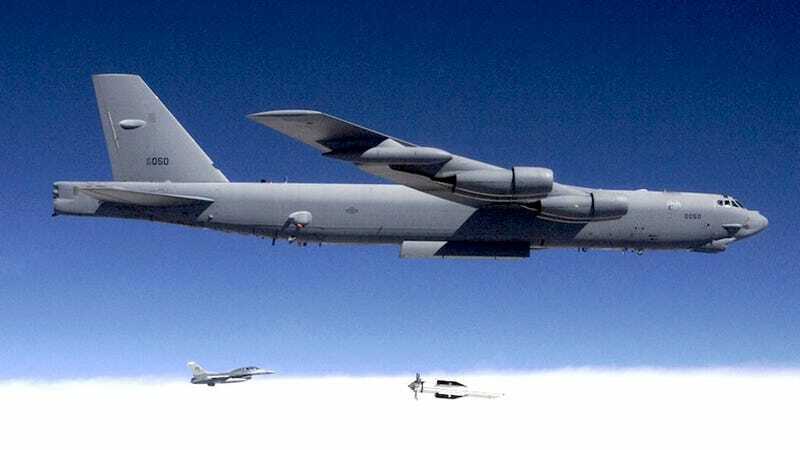 What's more, the bombs have been outfitted with counter-air defense systems to negate Iran's burgeoning electronic warfare and anti-aircraft capabilities. And if a single MOP can't do the job, as military analysts fear, the new iteration also employs an improved guidance system, allowing B-2 and B-52H bombers—the only two craft in the USAF capable of toting such a huge ordnance—to drop multiple munitions directly on top of one another, incrementally excavating the earthen defenses until one of them breaks through and wipes out the complex. And while it was adapted specifically for penetrating Fordow's defenses, the modified MOP will do a number on North Korea's lightly armored enrichment facilities if the need arises. Though, with any luck, that won't ever be necessary.